Sergeant Clutch Certified Engine & Transmission Shop sells and installs Heavy Duty External Transmission Coolers. Over 14 million transmissions fail every year and 9 out of 10 from overheating. 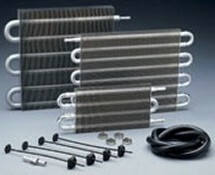 By installing an aftermarket external transmission cooler can help prevent costly transmission repairs. A properly installed external transmission cooler can prevent transmission fluid from overheating causing internal damage. An external transmission cooler can extend the life of automatic transmission fluid by reducing heat by as much as 60 degrees. With each 20 degree drop in operating temperature, transmission fluid and internal transmission parts life doubles. The best time to add an external transmission cooler is during a transmission rebuild or replacement service. When automatic transmission failure happens it can may times clog transmission cooler lines that flow through radiator. A lack of transmission fluid flow can damage new or rebuilt transmissions within minutes. Doing any of the following can increase transmission temperature.